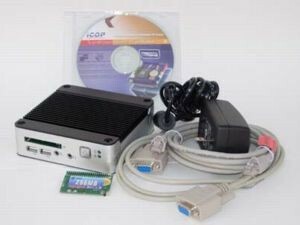 eBox-2300SX, an embedded system built with a 300Mhz Vortex86SX processor, 128MB DDR2 RAM, VGA, 10/100 Ethernet, two Serial ports, 3 USB 2.0 host, PS/2 keyboard, mouse, 24-bits GPIO and 512MB IDE bootable flash storage. RJ-45 Crossover Ethernet & Null Serial modem cable, use to link eBox-2300SX to Windows Embedded CE 6.0 Platform Builder development station for image transfer and debug. 180 days fully functional evaluation version of Windows Embedded CE 6.0 Platform Builder. Step-by-step guide to build Windows Embedded CE 6.0 image using Platform Builder tool. Step-by-step guide showing how to setup development environment to transfer image from development station to eBox-2300SX. Board-Support-Package, SDK and pre-built Windows Embedded CE 6.0 image. This kit provides step-by-step guide to learn Windows Embedded CE 6.0 in a hands-on-lab format. Without previous Windows CE experience, with the help of this jumpstart kit, average developers can build their first Windows Embedded CE 6.0 image within hours. In addition, this jumpstart kit also provides step-by-step information and example to setup and write Windows Embedded CE 6.0 application using Microsoft Visual Studio 2005. Developer can leverage their existing Visual Studio 2005 programming skill to create innovative solutions using Windows Embedded CE 6.0.